We currently live in a world where a movie based on an anime, directed by Robert Rodriguez and produced by James freaking Cameron is coming out the same week as a sequel to 2014's The Lego Movie, and yet I wanted to see this more than Alita; Battle Angel! Is that a sign of how much I loved the original Lego Movie, or how much I wasn't interested in Alita? The answer is... yes. 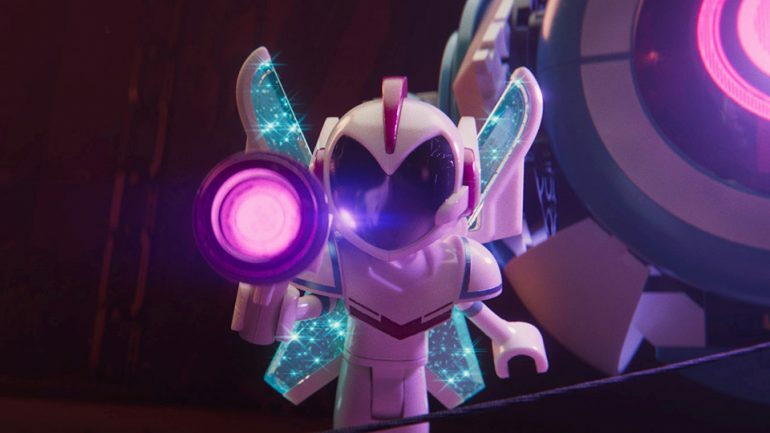 Note: Minor spoilers for Lego Movie 2, but full spoilers for the first. So go watch the first, if you haven't already. If you have watched it before, go watch it again because it's fun! I still can't believe a product placement movie franchise is THIS good. 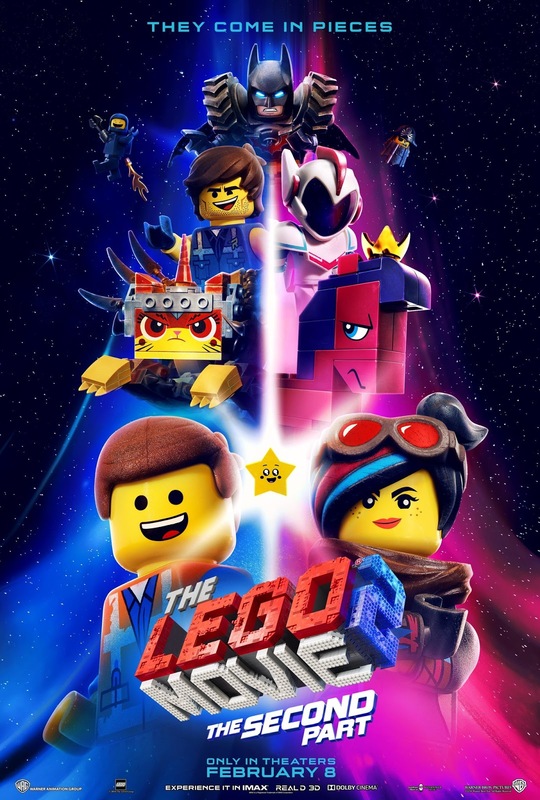 If you watched the previous movie, which you did before reading this review because you're a smart person who enjoys watching great films, you'll remember that it was revealed at the end that the Lego characters were actually being played with by a real boy who was trying to connect with his father. And in the end, he succeeded but this brought out a new threat in the form of his little sister! Cleverly, the film builds on that (HA! Build!) and doesn't drop the illusion that this is two kids playing with Lego, which is the right choice because we know what this world is now and it helps to propel the plot, as well as the meaning behind all of it. You maniacs! Do you know how much that probably cost?! Lego sets are stupidly priced these days! The set-up is that five years have passed now since the event of the first movie, and the alien invasion of the sister's toys has caused Bricksburg to become a Mad Max-ian wasteland where everyone has toughened up, gotten grittier and most angsty... well, except for Emmett (Chris Pratt). When a villain called General Sweet Mayhem (Stephanie Beatritz) kidnaps Emmett's friends and Lucy (Elizabeth Banks) so Batman (Will Arnett) can marry the alien queen Watevra Wa'Nabi (Tiffany Haddish), Emmett has to travel to the delightful and shining Systar System to save them. And quite frankly, you can tell what's going on in the real world with that description. "Reach for the sky!" Whoops! Wrong toy franchise. Almost all the original characters make a return, with the unfortunate exception of Vitruvius and Good/Bad Cop, and every voice actor is back. Charlie Day as the astronaut Benny, Alison Brie as Princess Unikitty (who has a new transformation that my friend is begging to get), Nick Offerman as Metalbeard, and even an all-too-brief appearance by Will Ferrell's President Business. If you liked them before, which you did, then you'll like them here. 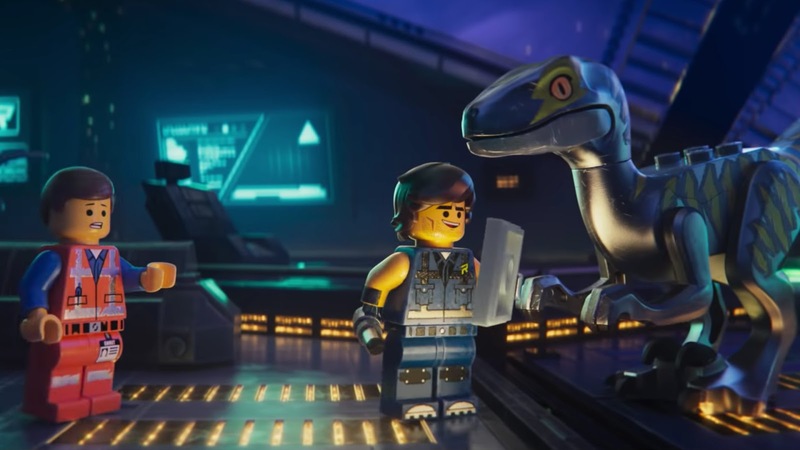 The best new character of the film is Rex Dangervest, also voiced by Chris Pratt. Unlike Emmett, Rex is a tough space-badass who travels around in a punch-spaceship and is exactly the type of man Emmett seeks to be so he can save everyone. 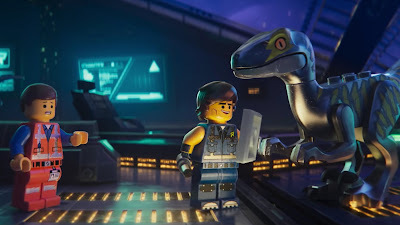 The most noticeable element about Rex is that he's clearly an amalgamation and parody of all of Chris Pratt's overcompensating roles, such as being a raptor trainer in Jurassic World, a cowboy in Magnificent Seven, a guardian of the galaxy in Guardians of the Galaxy etc, and it works as both a standalone joke for the character and a part of the overall story. Some of the most enjoyable scenes are just watching Chris Pratt talk to himself, and I'm almost surprised that doesn't literally happen at one point considering the meta moments here. So... does this mean Pratt is aware of how ridiculous his movie roles have gotten lately? While General Mayhem is a fairly fun character too, Queen Watevra Wa'Nabi is the scene-stealer whenever we see the Systar System, with a big personality and subtlety to her menace. She's a constantly shape-shifting alien made of several blocks, which means her form is moving around flawlessly to different shapes and styles, and this goes especially well alongside the musical numbers. Oh yeah, the film is a musical! At least, whenever we're in the Systar System. 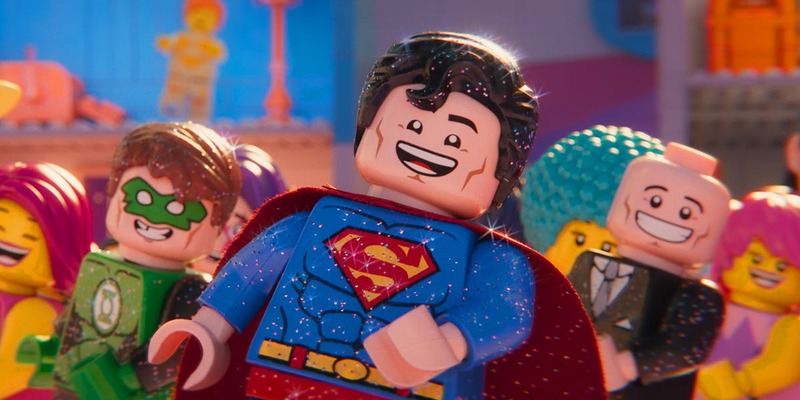 If you thought Everything is Awesome was the best earworm they could make, then the Lego Movie 2 laughs at you and kicks it up a notch with "Catchy Song". Every song in this is memorable, fun and full of colour, with the animation wonderfully creative throughout as it moves and flows like you would expect a Lego movie to do. I never realised how perfect a Lego musical movie would be, but this film gives me what I should have wanted all along. Well, comic-con. 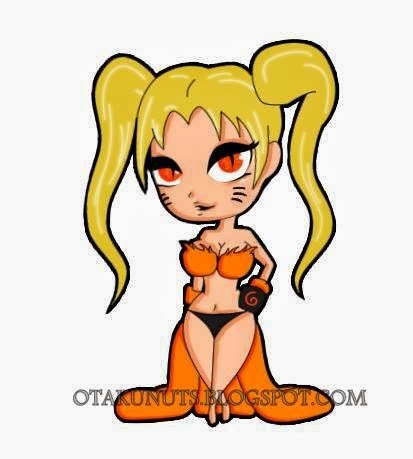 There's your new cosplay challenge! It doesn't get better than this. Sadly however, the movie isn't perfect. While its true that some of the themes presented are probably more relevant and relatable for a viewing audience of any age, which I'm trying not to mention since that could be considered a spoiler, the connection to reality and imagination has become more connected and that can be slightly jarring for the immersion of the story at times. Not always, but sometimes, you might find yourself pulled away to figure out what's going on and what's not. There are some lovely moments of emotion that are reach Pixar levels of quality, and great environments that were all constructed from Lego, so those moments will most likely be rare for the majority and you'll enjoy the ride. The comedy is still strong, but there are some more glaring faults than before. I laughed, a lot, but there were more times than before when I went "huh.." instead of "haha!". (I'm keeping it simple for the kids that might be reading this crap I spew out.) Most of the jokes definitely land, and the wit on display is usually inspired, but the comparison to the previous film means that the moments that don't land, such as an extraordinarily unfunny banana character, are more glaring. Again though, this is probably a nitpick by comparison to many other animated movies out there. I just realised I look like Benny... Well, that's distur-SPACESHIP! 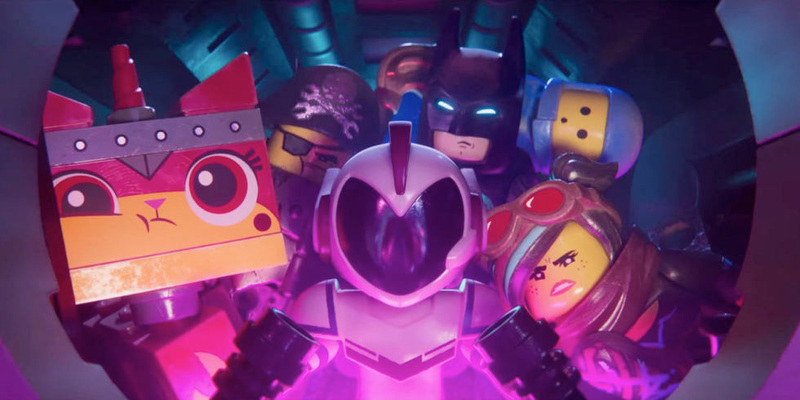 Is the Lego Movie 2 better than the first one? No, but I consider the last movie one of my favourite cartoon movies of the past decade, so beating that was almost impossible for this to achieve. The goals are higher, the imagination is spectacular, and the songs are as catchy as you expect from the geniuses that wrote Spider-Man: Into the Spider-Verse. It's still a great movie, easily going to be one of the best of 2019, and an entire building block above many of the competition out there. And trust me, that song's gonna get stuck inside your he-e-e-ead! Best Performance: Chris Pratt as Emmett Brickowski and Rex Dangervest. Worst Part: A few lame jokes.